The Mandala Madness eBook contains 5 exclusive designs not included in Mandala Melange or Mandala Medley. Color or paint these beautiful designs to use in your artwork or to relax. Just click the “Download for FREE” button below. This eBook is fully Printable. Collect all of our Mandala eBooks. They are perfect companions to the “Mandala Madness” Video Course. 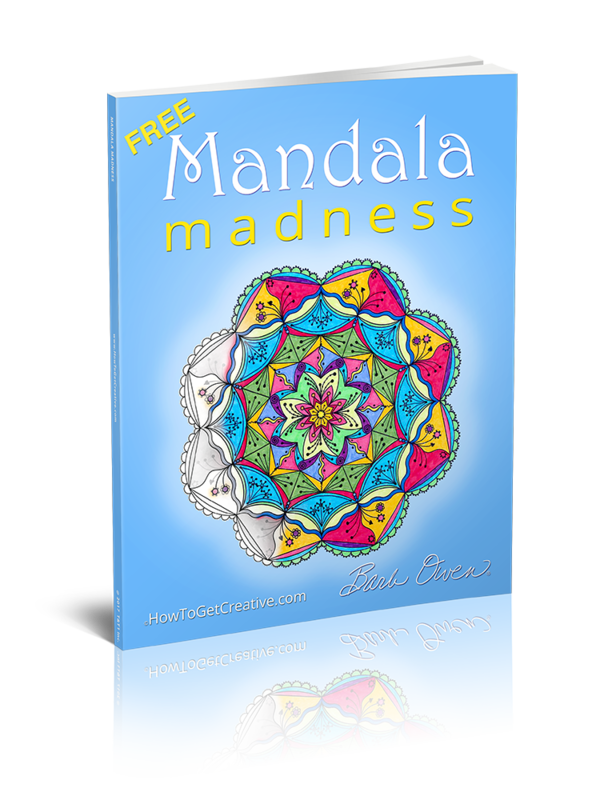 Mandala Madness is a FREE eBook including 5 of my exclusive designs just for YOU! Print them on paper or card stock. Grab your markers, crayons, pencils, colorful pens and create to your heart's content. These images are sized for printing on 8.5×11 inch printer paper. Circular art forms known as Mandalas appear everywhere – kaleidoscopes, compass roses, flowers, stained glass windows, celtic knots, snowflakes to name just a few. If you look around you’ll find inspiration in the patterns to include as you color and embellish your own beautiful creations. To learn how to create your own Mandalas, check out our “Mandala Madness” Video Course. As you can tell, I'm totally “mad” for Mandalas! !